Let the grandeur of Cipriani 42 take your New Year’s Eve in New York City to new heights. New Year’s in Times Square gets a luxurious update with Cipriani, one of NYC’s most acclaimed private event venues, renowned worldwide for its architectural magnificence. The opulent Ballroom of Cipriani’s sets the scene for this black-tie (optional) NYE gala - complete with white-glove service - that will give NYC’s social royalty a truly glorious start to the New Year. Spend this New Year’s Eve in resplendent style at Cipriani 42, Times Square, NYC’s premier name in luxury event space. A 6 hour premium open bar kicks off the night of elegant revelry with Cipriani’s trademark libations. Bask in the sumptuousness of Cipriani’s as you mingle with other best-dressed guests or take them for a spin on the massive dance floor in the Grand Ballroom. A live DJ will be performing the most magnificent mix of Top 40, Hip Hop, House, and Dance beats so you can turn up the heat on this classy soiree. That’s not all: Cipriani’s extravagant NYE party will pamper guests with deluxe complimentary amenities like delicious passed hors d’oeuvres, served in early evening. When midnight rolls around, raise a complimentary Prosecco toast as you join the heart-racing live countdown under Cipriani’s magnificent roof. To take your night even higher, pamper yourself with Cipriani’s signature VIP treatment with VIP packages with exclusive amenities like priority admission, reserved seating, and table service. If this NYE at Cipriani’s is any indication, the New Year is going to be a glorious one. Centrally situated in Times Square area, Cipriani 42 is a magnificent architectural feat that dates back to 1921. Originally constructed as a bank for rich New Yorkers, Cipriani has retained the classic grandeur of the era that makes it a premier venue replete with class and beauty. This NYC landmark boasts a majestic Grand Ballroom complete with splendid chandeliers, a lofty 65’ ceiling, and awe-inspiring marble columns. With its roots in Venice as a symbol of haut cuisine, no wonder Cipriani’s is so favored by New York’s social elite and has become a forerunner in luxury event spaces with a first-rate international reputation. Taking exclusive events to new levels, Cipriani 42 is the finest setting for a striking NYE. This New Year’s Eve, indulge in a celebration unparalleled in class and luxury. 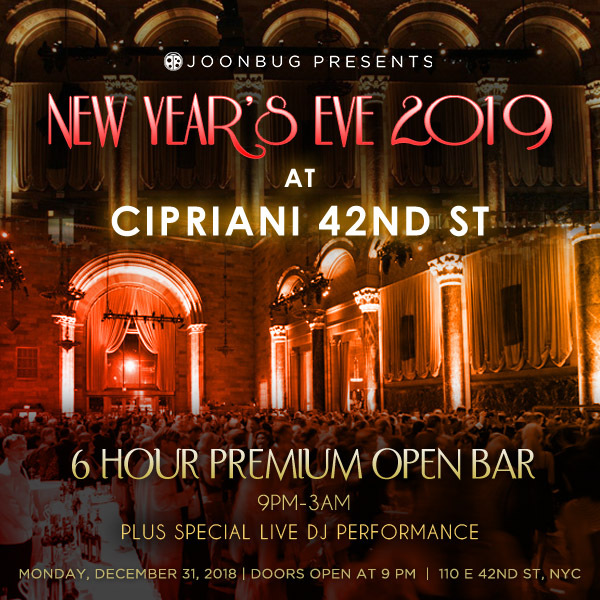 Whether you’re taking in Cipriani’s magnificent setting or its gorgeously dressed guests, or dancing the night away in splendid style, New Year's will be an unforgettable night.